Comic-Con International has posted the schedule for Preview Night (Wednesday, July 18) and Thursday, July 19. You can view the full schedule here and below are the panels and events that we’ll be looking forward to. Stay tuned to ComingSoon.net’s Comic-Con Hub for all the latest updates! Which panels/events on the Comic-Con 2018 schedule for Thursday and Preview Night are you looking forward to the most? Let us know in the comments below. Comic-Con and Warner Bros. Television proudly continue their annual Preview Night tradition with the exclusive world premiere screening of new series Manifest as well as sneak peeks at fan favorites The 100 and Gotham. Plus, brand-new episodes of Freedom Fighters: The Ray. From the ominous horns of Jaws or A Quiet Place signaling fear, to the heroic Star Wars theme, music has always been an important supporting character in movies. In the world of superheroes, music sets an emotional tone more than virtually any other genre. This panel offers a behind-the-scenes look at the music of today’s biggest superhero film and TV projects with unreleased film clips and never-before-heard music. Participating composers include Tyler Bates (Deadpool 2, Guardians of the Galaxy 2), Marco Beltrami (Logan, The Wolverine), Christophe Beck (Ant-Man and the Wasp), Kurt Farquhar (Black Lightning), and Blake Neely (The Flash, Arrow, Legends of Tomorrow). Moderated by Ray Costa of Costa Communications. Limited-edition statues, action figures, prop replicas, busts, vinyl . . . DC Collectibles has them all-and more. The DC Collectibles crew, including executive creative director Jim Fletcher and Academy Award-winning special makeup effects artist Rick Baker and several special guests discuss how they come up with so many great ideas, and what’s coming up from the maker of awesome collectibles! Featuring creatives behind Deadpool 2, Cobra Kai, Trollhunters: Tales of Arcadia, DC Super Hero Girls, Prince of Persia, Mummy VR, Halo, God of War, and Legend of Zelda. Experts in the sound field, including composers, sound mixers, and sound editors, talk about setting tone and controlling the soundscape down to the pow of the last karate chop. Whether slaying trolls, chasing the undead, or beating the bad guys, sound is an essential part of telling stories in films, TV shows, and video games. Panelists include Leo Birenberg and Zach Robinson (Cobra Kai), Tim Davies (Trollhunters: Tales of Arcadia), Michael Gatt (DC Super Hero Girls, Braid), Mark Stoeckinger (Deadpool 2), Penka Kouneva (Prince of Persia, Mummy VR). Moderated by Chris Villain (content creator) and Bryon Burton (journalist for The Hollywood Reporter). Dan DiDio and Jim Lee are the forces behind DC Publishing, including DC Vertigo, MAD, DC Black Label, DC New Age of Heroes, and much more. This up-close-and-personal panel gives you unique access to the leaders of your favorite comic book line! BBC America’s Doctor Who panel introduces the 13th Doctor, played by Jodie Whittaker (Broadchurch). Marking a new era for the legendary Time Lord, Whittaker will be joined on the panel by two of her co-stars, Tosin Cole, and Mandip Gill, who play Ryan and Yasmin, as well as award-winning series showrunner Chris Chibnall (Broadchurch) and executive producer Matt Strevens (An Adventure in Space and Time). 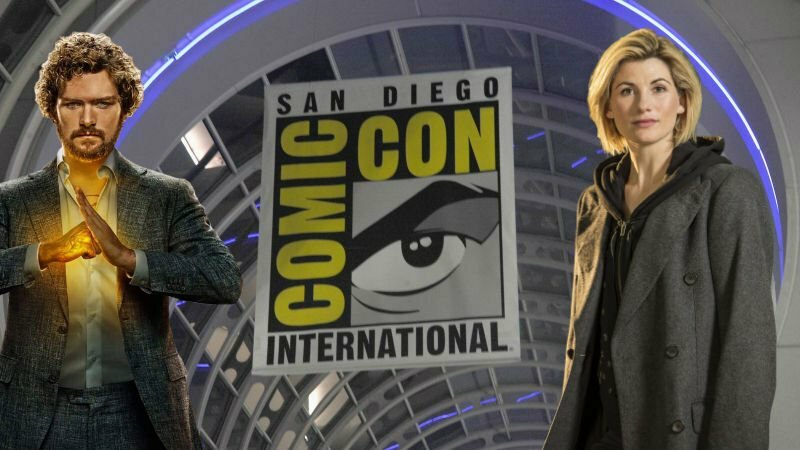 With this year’s highly anticipated season packed full of action, adventure, humor, and emotion, this will be the cast’s first-ever panel appearance ahead of Doctor Who premiering this fall on BBC America. DC Entertainment publisher/chief creative officer Jim Lee (Superman Unchained, Justice League, Batman, Suicide Squad) talks about his 25+ years in the comics industry and sketches your favorite characters live on the big screen. This is a great opportunity to watch the creative process firsthand and learn the tips of the trade that bring DC Entertainment’s characters to life. Get an inside look at the latest and greatest from Marvel Games. Attendees will see exciting sneak peeks of Marvel’s Spider-Man, Marvel Powers United VR, and Marvel Battle Lines, with many unannounced surprises and panel exclusives. Host Greg Miller (loudmouth at KindaFunny.com) will be joined by Mike Jones (vice president & executive producer, Marvel Games), Bill Rosemann (executive creative director, Marvel Games), Bryan Intihar (creative director, Insomniac Games, Marvel’s Spider-Man), and others. Rise up! The Teenage Mutant Ninja Turtles are back in Nickelodeon’s brand-new mutation of New York’s half-shell heroes. Featuring Omar Miller (Ballers) as Raph, Ben Schwartz (Parks and Recreation) as Leo, Josh Brener (Silicon Valley) as Donnie, Brandon Smith (You’re the Worst) as Mikey, Kat Graham (The Vampire Diaries) as April, and Eric Bauza (Teenage Mutant Ninja Turtles 2012) as Splinter. Joining the cast are co-executive producers Andy Suriano and Ant Ward and legendary voice director Rob Paulsen. Panel highlights to include never-before-seen clips from the upcoming series. Moderated by Buzzfeed’s Keely Flaherty. DC is entertaining fans across all platforms. Film and TV critic Scott “Movie” Mantz talks with authors Mark A. Altman (The Fifty-Year Mission) and Edward Gross (Slayers & Vampires) about their new oral history, So Say We All (Tor Books), an exhaustive look at the classic 1978 original series, Ronald D. Moore and David Eick’s beloved 2004 re-imagining, and even the much maligned Galactica 1980. Find out the untold secrets and incredible true stories of these classic shows in this celebration of four decades of Battlestar Galactica. Win a chance to be the first to get a copy of the new 700+ page hardcover book autographed by the authors. English voice actors for Goku and Vegeta, Sean Schemmel and Christopher Sabat, talk all things Dragon Ball -and reveal never-before-seen material for the new movie. Don’t miss some special surprise appearances, too. Comic-Con special guest Jeff Lemire (Black Hammer, Descender, Gideon Falls) and veteran comic book editor Will Dennis discuss Lemire’s various creator-owned projects and for the first time preview both the upcoming Family Tree and Ascender! Panel will feature Dustin Nguyen (Batman, Descender) and a Q&A session. Marvel Rising brings together the next generation of Marvel superheroes for the next generation of Marvel fans. Be among the first to get a sneak peek at this group of powered teens and their adventures that are full of heart, action, comedy, and powerful messages for every kind of Marvel fan. The show’s Quake Chloe Bennet (Marvel’s Agents of S.H.I.E.L.D. ), Squirrel Girl Milana Vayntrub (This Is Us, Silicon Valley), Ms. Marvel Kathreen Khavari (Big Little Lies, Marvel’s Avengers Assemble), Patriot Kamil McFadden (K.C. Undercover, Grown Ups 2), Cort Lane (SVP, Animation and Family Entertainment), Marsha Griffin (VP, Animation Current Series and Development), and Sana Amanat (VP, Content and Character Development) present an action-packed panel that showcases the first look of the animated shorts, special announcements, and so much more. Moderated by Lorraine Cink. Celebrate 30 years of the Blue Bomber with the talented developer veterans from Capcom. Producers Kazuhiro Tsuchiya (Mega Man 11) and Nonaka Daizo (Mega Man X Legacy Collection 1 + 2) discuss their work on the iconic side-scrolling series in a panel moderated by Capcom’s Tim Turi. Get equipped with behind-the-scenes insights on the new Mega Man 11 and other recent titles. The festivities will include trivia, prizes, and more.